TCI Manufacture some of the best Hi-fi interconnects available using aerospace grade materials to give top quality and long term reliability. TCI Tiger, Viper and Cobra have all recieved excellent Speialist press reviews, TCI Hi-Fi Interconnects have recieved What Hi-Fi 5 stars awards, Hi-Fi Choice Bronze award winner and AV Review website interconnect of the year. Select from the links on the right for more details. 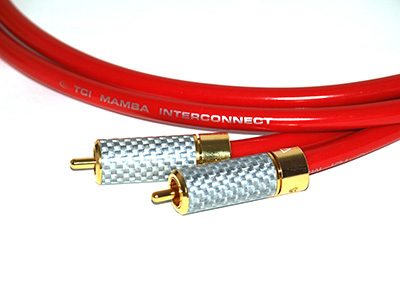 TCI Mamba is our newest interconnect and is fitted with True-Plug gold plated locking RCA plugs or Gold Plated XLR plugs. These provide a reference quality connection further enhancing the performance of this state of the art cable. 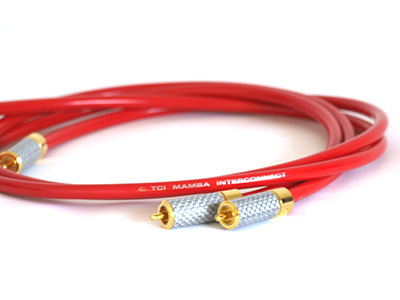 TCI Mamba features Aerospace quality conductors and insulation to enhance sonic abilities to near reference quality performance. - Designed, hand made and finished in the UK.